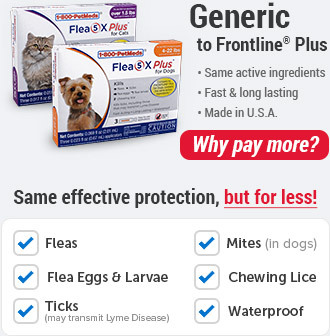 Centragard is a topical solution for cats that provides protection against heartworm disease caused by Dirofilaria immitis and treats and controls roundworms, tapeworms, and hookworms. 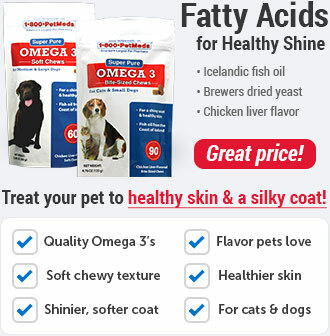 It is a safe, monthly topical medication for cats and kittens 7 weeks of age or older and 1.8 lbs or more. Centragard comes in single-use applicators for simple administration. Centragard requires a prescription from your veterinarian. When applied, Centragard absorbs through the skin and circulates into the bloodstream. Concentrations of eprinomectin and praziquantel, the active ingredients, in the tissue and bloodstream help prevent heartworm disease and treat and control other worms. For topical use in cats only. Do not administer orally. The safety of Centragard hasn't been tested in breeding, lactating, or pregnant cats. It also hasn't been tested in kittens less than 7 weeks of age or weighing less than 1.8 lbs. What is the most important thing I should know about Centragard? Centragard is a prescription medication that is applied topically once a month. It should not be used on kittens under 7 weeks old or cats or kittens weighing under 1.8 lbs. 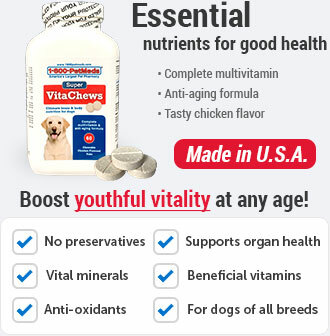 When replacing another monthly heartworm preventive product in a heartworm prevention program, the first treatment with Centragard should be given within one month of the last dose of the former medication. 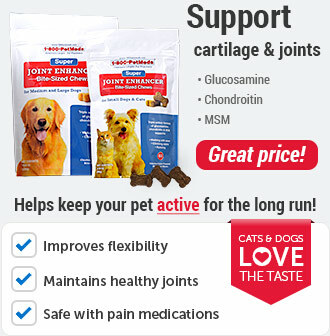 What should I discuss with my veterinarian before applying Centragard on my pet? At the discretion of your veterinarian, cats older than 6 months of age may be tested to determine the presence of existing heartworm infection before treatment with Centragard. Tell your veterinarian if your cat is pregnant, lactating, or breeding. Let your veterinarian know if your pet has ever had an allergic reaction to the ingredients, eprinomectin or praziquantel. How should Centragard be applied? 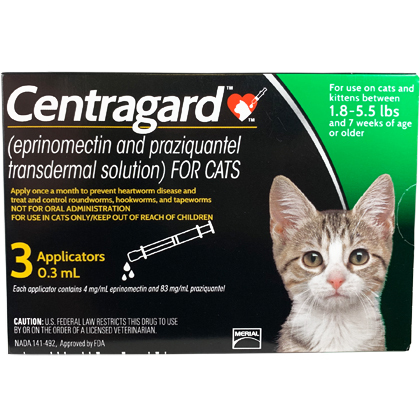 Apply Centragard to your cat exactly as directed by your veterinarian. If you don't understand the directions, ask your pharmacist or veterinarian to explain them to you. 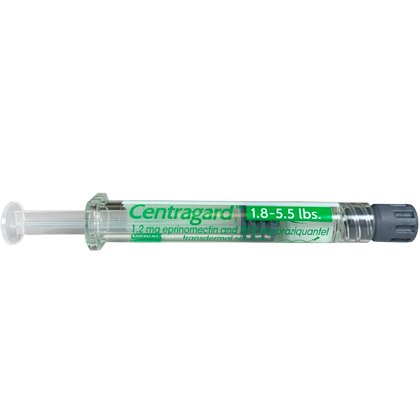 Centragard is dosed at a minimum of 0.055 ml/lb, which delivers a dose of 0.23 mg/lb eprinomectin and 4.55 mg/lb praziquantel. Administer the entire contents of the applicator topically once a month. What are the potential side effects of Centragard? Side effects of Centragard can include vomiting, anorexia, lethargy, temporary clumping or spiking of the hair, and mild skin reaction. What happens if I miss giving a dose of Centragard? If a dose is missed, give the next dose as soon as you remember and resume a regular monthly dosing schedule. What happens if I overdose my pet on Centragard? If an overdose is suspected, contact your veterinarian immediately. 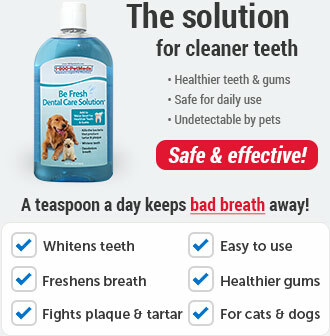 What should I avoid while applying Centragard on my pet? Avoid contact with the eyes or mouth. Apply Centragard onto the skin only. What other drugs will affect Centragard? 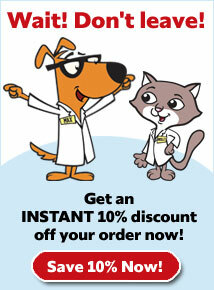 Do not apply if your cat has been recently treated with another heartworm medication. To apply Centragard to your cat, pull back the plunger of the applicator slightly and remove the cap. Part your cat's hair in one spot on the midline of the neck between the base of the skull and the shoulder blades, place the top of the applicator on the skin and empty the entire contents directly onto the skin. For cats over 16.5 lbs, use the appropriate combination of applicators directed below. If your cat requires a second application, apply the contents of the second application on the same location as the first application. Wash your hands after administering the product. Avoid contact with the application site for 5 hours following treatment. Apply one 0.3 ml applicator (Green) topically once a month. Apply one 0.9 ml applicator topically (Red) once a month. Apply one 0.3 ml applicator (Green) plus one 0.9 applicator (Red) topically once a month. Apply two 0.9 ml applicators (Red) topically once a month.